Each one can hold a water bucket. The starting base for all potions. Made by filling a glass bottle from a cauldron or water source. 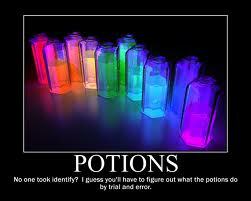 Reagents are used in conjunction with the above components to produce a whole array of potions and splash potions. Base-affecting reagents are necessary to create primary and tertiary potions and affect the duration and intensity of a tertiary potion's effects. Gunpowder affects the application of the potion when used (thrown vs. being consumed by the player). where the thrown potion lands. Paired effecting reagents are effecting reagents that create negative tertiary potions when paired with a Fermented Spider Eye. All primary potions are created by brewing a single reagent with a Water Bottle and can be combined with Gunpowder to create their throwable Splash Potion counterparts. Minecraft News and Upcoming Features!